Pam’s Pictorama Photo Post: Hailing from McMinnville, Oregon, October 3, 1911! Still yet another terrific turn-of-the-century postcard from the great Pacific northwest. Evidently McMinnville is in the heart of the wine country, between Portland and the coast – these fellows look as if they may have been imbibing a bit, or preparing to, but that is pure speculation on my part. The guy in the lower left looks like a bit of a bum for my money – not as natty as the others, pork pie hat shoved back on his head; couldn’t be bothered. No cat holding for him – he’s too cool. 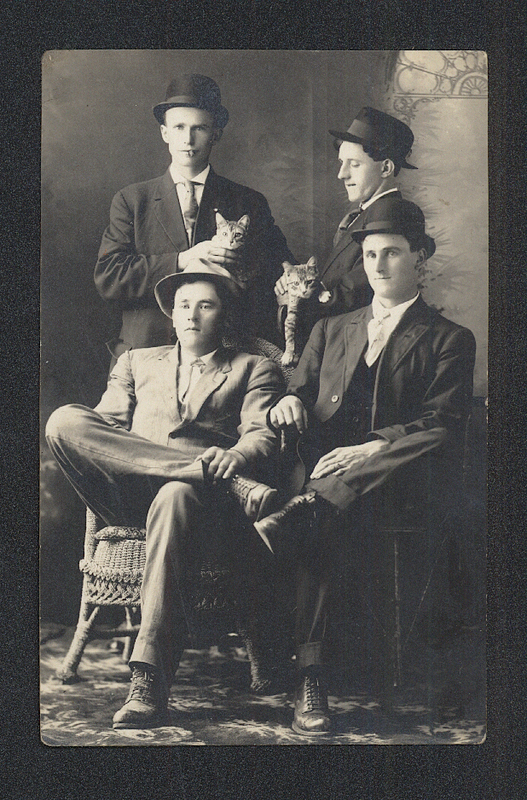 I love that these guys, all dressed up, bowler hats and all are posing with these two kitties. Tabby cats always strike me as especially scrappy, so they seem a good choice for these young gentlemen. Cool with cats, I’d say.